A wind turbine, which is installed on top of a tall tower, collects kinetic energy from the wind and converts it to electricity that is compatible with a home’s electrical system. In a normal residential application, a home is served simultaneously by the wind turbine and a local utility. If the wind speeds are below cut-in speed (7-10 mph) there will be no output from the turbine and all of the needed power is purchased from the utility. As wind speeds increase, turbine output increases and the amount of power purchased from the utility is proportionately decreased. When the turbine produces more power than the house needs, the extra electricity is sold to the utility. All of this is done automatically. In this way the wind turbine can typically lower your electricity bill by 50 to 90 percent. Wind turbines produce no pollution and by using wind power you will be offsetting pollution that would have been generated by your utility company. As well as this, it is virtually noiseless and can be easily retrofitted to any home; no need to rewire your house in any way. 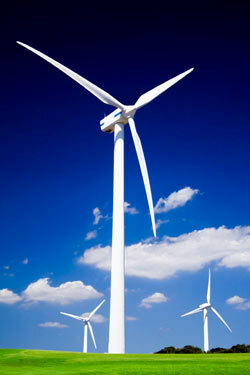 The turbines are also built to last and require very little maintenance. Although somewhat expensive to fit, wind turbines typically pay for themselves within 6-15 years, making it a sound investment.